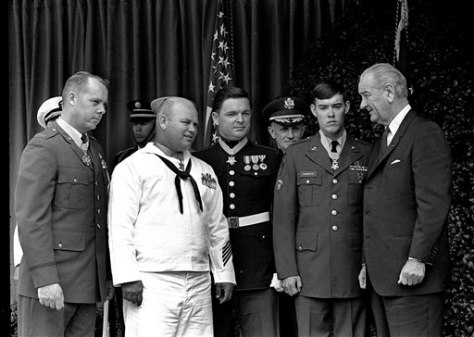 In this May 14, 1968, file photo, U.S. President Lyndon Johnson, right, poses at the White House with four winners of the nation's highest award, the Medal of Honor. Decorated for valor in Vietnam, they are, from left: Air Force Capt. Gerald O. Young, of Anacortes, Wash.; Navy Boatswain's Mate James E. Williams, of Rock Hill, S.C.; Marine Sgt. Richard A. Pittman, of Stockton, Calif., and Army Spc. 5 Charles C. Hagmeister, of Lincoln, Neb. Others are unidentified. Pittman and the other recipients can proudly and truthfully say they were awarded the Medal of Honor for their valor in Vietnam. After a recent Supreme Court ruling, anyone else is free under the First Amendment to make the same claim, whether it's true or not.